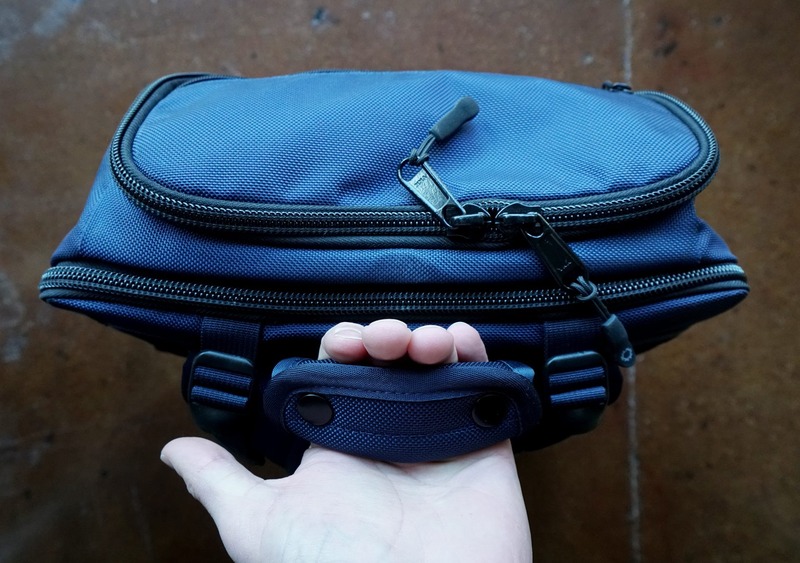 In this review, we are checking out the DSPTCH Travel Pack. That is pronounced “Dispatch,” for the record. Clearly vowels just aren’t cool anymore. In general, we’ve really been liking this pack. They’ve managed to pack a bunch of nice features into this thing while keeping a minimalistic look, which is no easy feat. There are a few low points on this bag but quite a few high points. And for the Pack Hacker veterans out there, this is one of the first packs we’ve tested that is not gray or black! Can you believe it? We really got out of our comfort zone with this one. 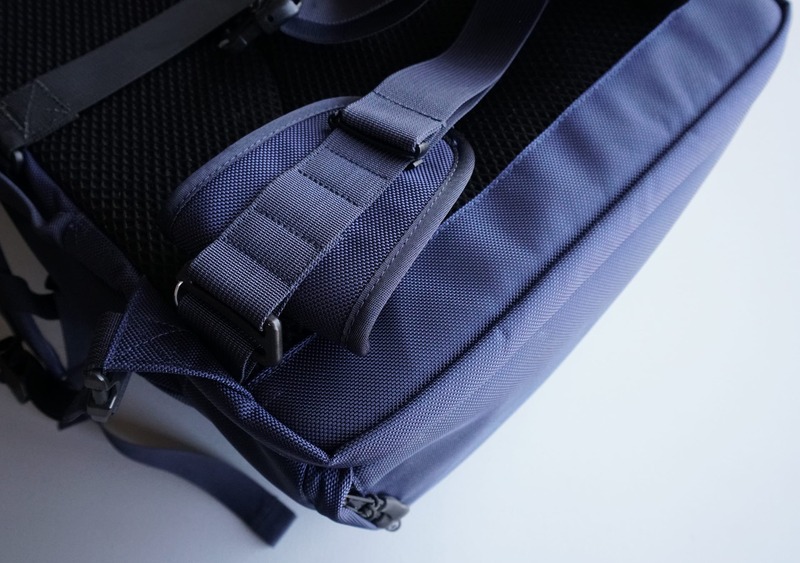 The DSPTCH Travel Pack is one of the few packs we’ve reviewed that comes in a wide variety of colors, which is awesome. They’ve got a couple of gray and black varieties, a navy, a mossy green, and a camouflage one if you like to hide from people during your travels. We did notice that some of the speckled colors appear to be made from a different fabric, just based off the photos on their site. We’ll try to investigate further and see if this is true, but something to keep in mind if you’re interested in buying this pack. 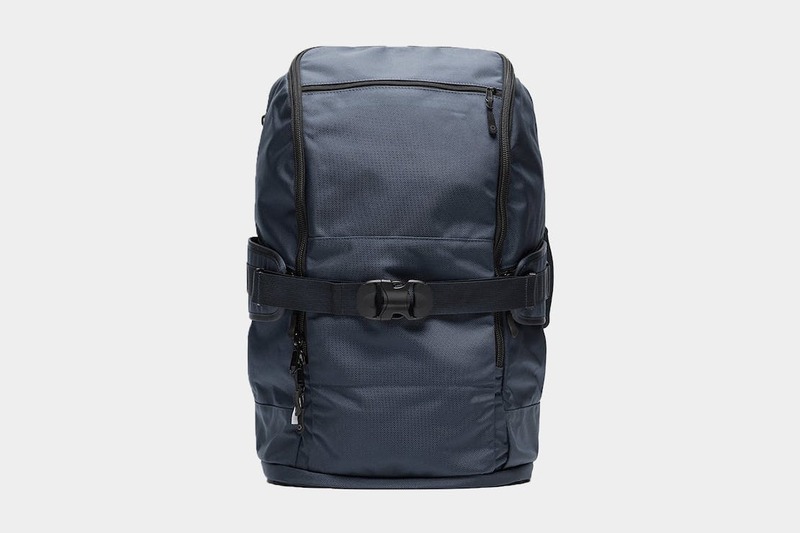 We have the Navy version and have confirmed with DSPTCH that it is made of 1680D ballistic nylon. This is a nice fabric—it really feels sturdy and durable. We’ve tested a few other packs with 1680D ballistic nylon and never had any problems with durability, so that’s always a good sign. And as we said above, we really like the look of this bag. It’s got a great minimalistic, clean look but it’s still highly functional. It can definitely be used for one bag travel (30L in volume), and we think most people would be pretty shocked if you told them you’re living out of this thing. It does have a compression strap system, but even without that it’s not overly bulky. And the navy is a nice change from the black and gray bags we tend to see day in and day out. We should mention that this is one of the heavier packs we’ve reviewed. It weighs in at 4.19 pounds (1.9kg) when empty. For most of us, this shouldn’t be a huge issue but if you are doing a lot of walking and looking into that ultralight realm, you’ll want to keep this in mind. It may look like there aren’t many external components on this pack, but once you start to actually dive into it there are a handful of solid features. The overall harness system is pretty straightforward—it’s got some high density foam straps with a nice sternum strap. The shoulder straps are adjustable at the bottom and have buckles for removal (more on that later). The sternum strap is super adjustable and it’s got Duraflex buckles on it, which are some of the highest quality plastic buckles you can find. 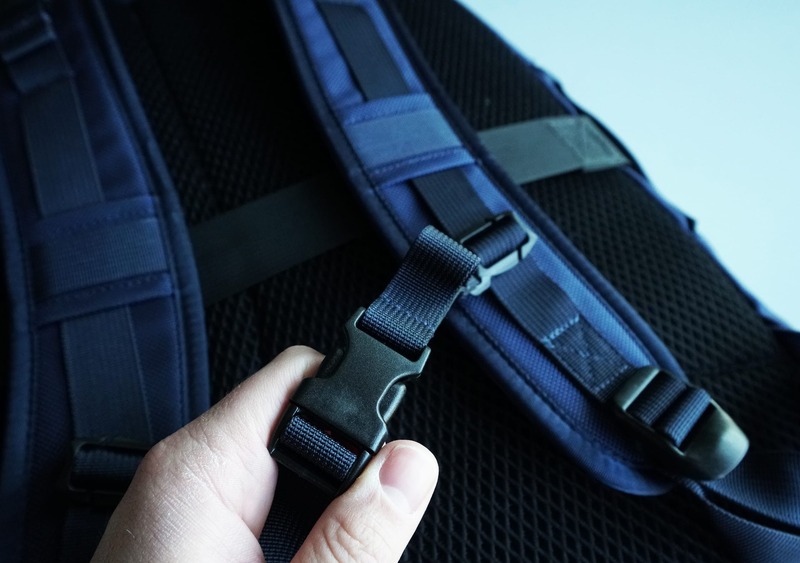 We were happy to see this, as plastic buckles can often be a weak point on backpacks. All the buckles on this bag are Duraflex, actually. Underneath the straps is a nice mesh backing. This stuff adds a bit of comfort and ventilation, and although it’s not going to completely prevent that dreaded back-sweat on a hot summer day, it should help. The frame sheet beneath that mesh backing is a little less sturdy than we’d like. It’s a pretty good compromise between stiff and flexible—it’s still comfortable, but is lacking a bit when it comes to support. On the top of the pack there are some load-lifter straps, which are sweeet! We’ve mentioned these before—they are really nice if you’re carrying a heavy pack. Use them once and you’ll never go back. Really not much to say here, this whole section looks pretty good. Oh… Except for one little thing. Well, two. We’re into one bag travel here, so we generally stay away from roller luggage. 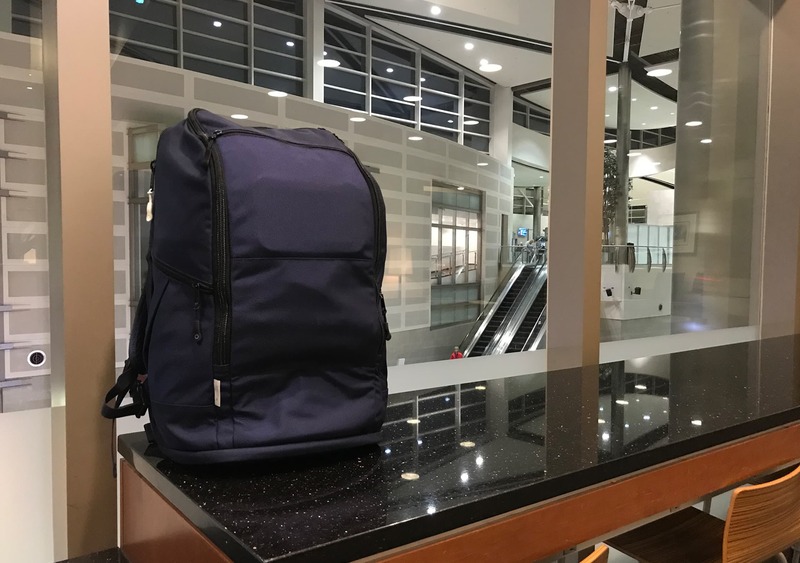 That being said, it has its purpose and we totally understand why some people might want to roll their luggage, but for the most part we are team backpack. Anyway, you can attach this handle to the top of most standard rolling luggage. But we found that the top of the pack actually sat above the top of the handle on an old TravelPro suitcase. This means you can’t roll the luggage around very easily—not to mention that the straps and hip belt are just all over the place. This seemed like a design oversight from DSPTCH, but your mileage may vary depending on the height of your roller suitcase handle. In our case, it’s usable, but we’d rather just throw the pack on and roll our suitcase around like normal. The other little gripe we had with this area of the pack is this strap that runs horizontally across the frame sheet. This is used in the roller luggage scenario (you can run the handle through it), and it does a good job there. But it’s also supposed to be used to secure the shoulder straps. 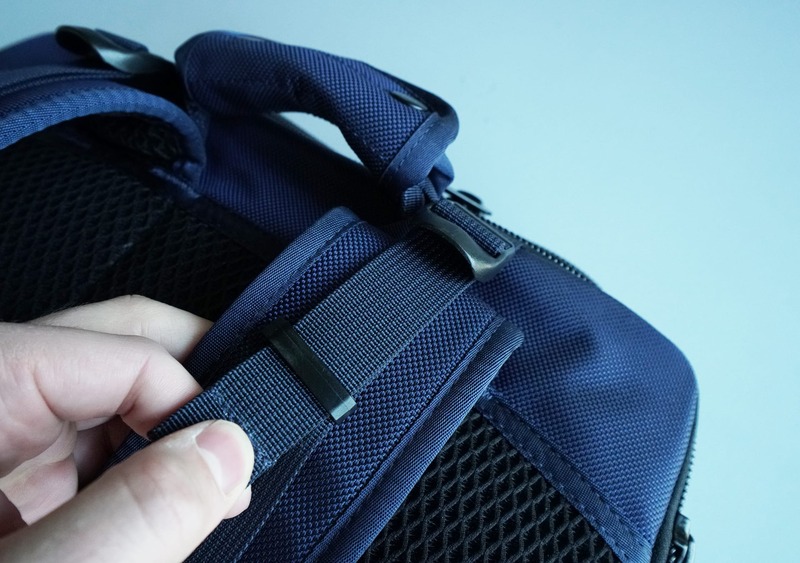 The Shoulder Strap Hideaway System—Maybe a Bit Too Simple? It’s simple enough—you just unbuckle the shoulder straps from the bottom, and stuff them under the horizontal strap. While it is extremely easy and quick to do this, it’s just a bit too simple. It doesn’t secure or conceal the straps all that well—you’re still going to have straps hanging all over the place. If you’re concerned about your straps getting caught in a conveyor belt or getting snagged on an armrest, this little system probably won’t help much. We’ve seen this done really well on a few other packs, and we just wish this had a bit more than the single strap to hold/conceal everything. We also thought the metal clip to secure this strap was pretty lackluster—it doesn’t seem too secure and looks like it could potentially fall off on its own. With all that said, we’ve saved the best external feature for last. The hip belt. This hip belt has some really great features and we’ve been impressed by its functionality. It’s a pretty standard hip belt with a big old duraflex buckle, but as you adjust it, it has these great clips on the end of each strap that you can use to clip any excess strap to the side of the hip belt (if you’re confused, check out 4:00 in the video). Just kidding, it’s not that bad. But you will look a bit silly. But the other cool part about this hip belt is that it doubles as a compression strap. A multi-functional hip belt? Hell yeah! You can detach the hip belt from its traditional spot and clip it to the front of the pack to be used as a compression strap. We liked this for two reasons. 1) Compression straps are awesome. 2) When the pack is empty/light, you’re going to want to use the compression straps to keep everything compact, but you won’t need a hip belt because it’s super light. And then when the pack is really full/heavy, you won’t need the compression strap but you will need the hip belt. This kind of blew our minds. Kudos to the design team over at DSPTCH, they really nailed it on this one. 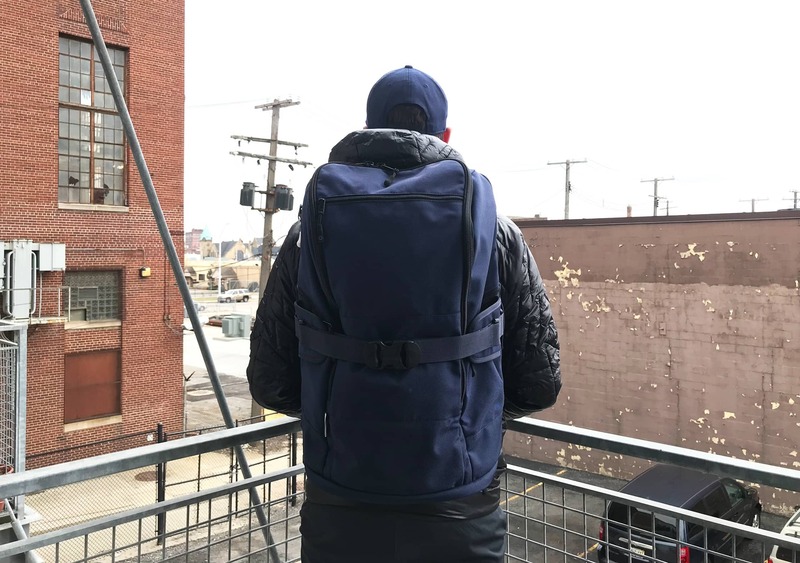 Our only grievance is that one compression strap isn’t totally ideal—you generally want two straps to compress the entire bag (the Aer Travel Pack is a good example of this). You just can’t get quite as much compression with one strap in the center of the bag. As much as we like the hip belt we do feel like the roller luggage system compromised this area of the pack a bit. We would’ve liked to see more of a focus on the backpack itself and less on the roller luggage aspect. But still, that hip belt is sweet. Before we get into the main compartment, we’ll check out this quick grab pocket on the top of the bag. 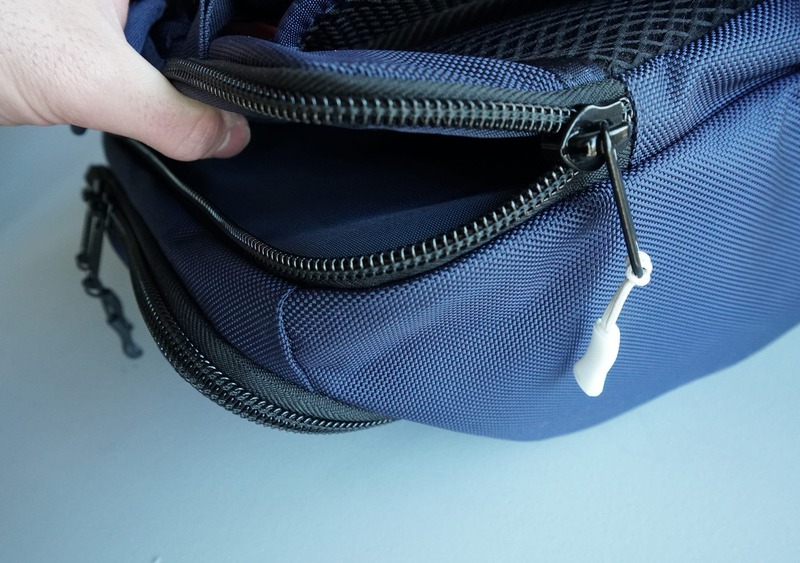 We tend to see these kinds of pockets on most travel packs, and they are awesome for throwing some of your things in while getting through airport security. The thing that separates this from most quick grab pockets is that you can actually access it from the outside and inside of the pack. This is a pretty cool feature that is actually more useful than you may think. If you’ve got the pack totally opened up and you realize you need something from the quick-grab pocket—it’s right there. No need to close the whole pack up and get all discombobulated. Moving on to the sides of the pack, there are two gusseted pockets which can hold a water bottle or some bulky items. If you’re not up to date on your sewing lingo, a gusset is “a triangular or rhomboidal piece of fabric inserted into a seam to add breadth or reduce stress from tight-fitting clothing.” Thanks Google! Basically they will compress when not in use and expand when full. It’s been a long time since high school geometry class, so we’re still not entirely sure what a rhombus is. But needless to say, we are now big fans. Thanks to those gusseted pieces of fabric, these pockets really don’t take away from the minimalist look of the bag when not in use. Awesome. Store Your Dirty Shoes (or Anything Else) Here! On the bottom of the pack there is a nice little shoe compartment. #5 YKK zipper on this pocket, which we always like to see. There are YKK zippers throughout this bag, by the way. 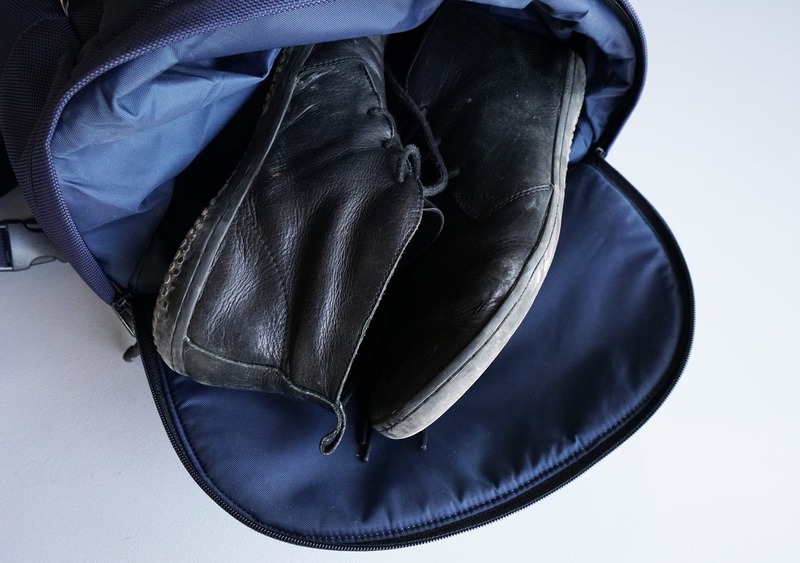 You can throw in a dirty pair of shoes here—or a dirty pair of anything, really—and not worry about it mucking up the inside of your pack. PSA: This compartment does not have a waterproof lining, so you should be careful about throwing in a wet pair of shoes or something. Dirt and grime should be fine though. Moving on, we’ve got a laptop compartment in the traditional laptop compartment area of the pack. This one does have a nice white zipper pull on it, which is a cool feature—it just makes it very clear that this is a separate pocket for your laptop. This would be a nice laptop compartment if it were sized a little more appropriately. It’s just a really odd configuration. You can barely fit a 15” Macbook Pro in here, vertically. If this compartment went down the full length of the pack it would work fine, but it only goes down about two thirds of the way. So while it will fit, it’s a bit of a struggle. If you have anything bigger than a 15” laptop, there is just no way. But the really weird thing is that you can actually fit a 15” laptop in here horizontally! You can get it in, but it’s quite the challenge to get it out. We would have liked this compartment to be a bit deeper, and some padding wouldn’t hurt here either. We’ve got a padded incase sleeve for our laptop which makes it even harder to get it in and out. But we’re gonna keep that case on because we don’t mess around when it comes to protecting our laptops—and you shouldn’t either! Right above that laptop compartment is the main storage compartment, and we have been really liking this area of the pack. 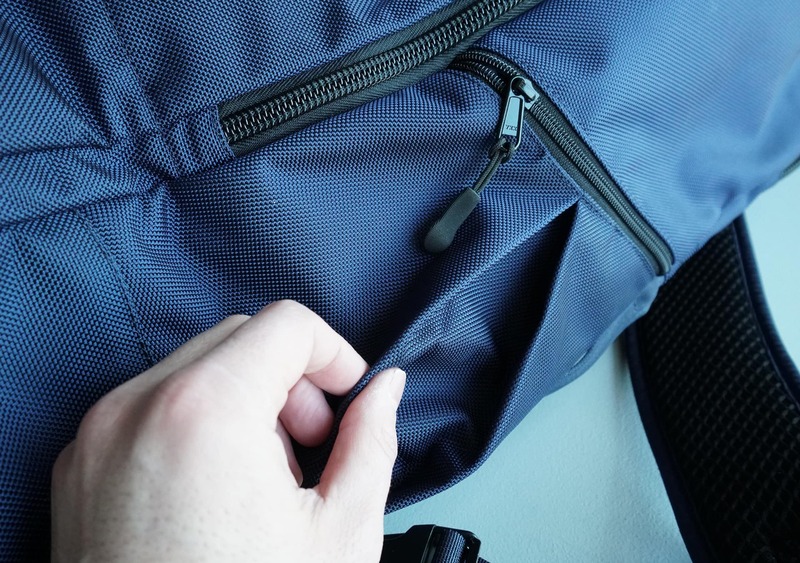 DSPTCH has come up with a very unique and functional design for the main compartment, which involves this rectangular zipper. As you open up this zipper you’ll see the inside of that quick-grab pocket, with another zip so you can access it from inside. 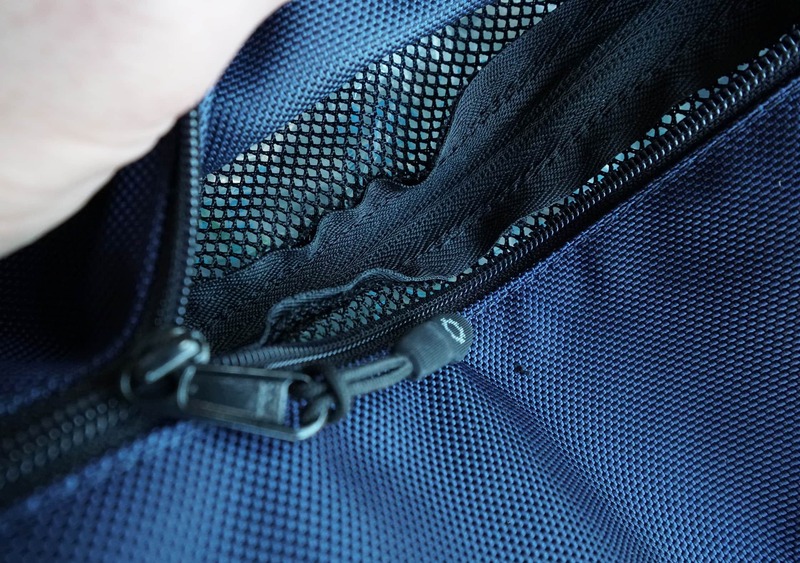 We did notice that this internal access creates some extra fabric on top of the zipper—it looks a little bit sloppy, but we’re pretty thrilled with the convenience here so we’ll let it slide. The cool thing about this rectangular zipper is that you can open up the pack just about all the way. When fully opened you can see all the stuff in this compartment and move things around as necessary. It’s sort of like a hybrid between a top-loader and a clamshell—something we have yet to see on any other packs. We’ve found this to be super convenient and functional. …Are you noticing a theme here? We should also mention that DSPTCH claims this pack is 30 liters in volume. We’ve delved into the backpack volume argument before (there’s really no set standard for measuring this stuff) and with that in mind, we think this pack is actually slightly larger than 30 liters. Just based on other 30 liter packs we’ve tested, this one seems to fit more stuff than most. In that main compartment there is a sleeve with an elastic band that provides some organization, and the elastic will let you fit larger items in there while keeping everything in place. On each side of the internal compartment are two mesh pockets. These are kind of similar to the gusseted pockets on the outside—they’re almost in the same exact spot—and could be used for some further organization with socks, underwear, or a water bottle. The final pocket on the inside of this pack is this cool mesh pocket that is sort of hanging in the middle of the bag. Using our trusty pop-tart scale, you could fit about 2 Pop-Tarts in here. This is a really unique feature and we think it can be a great security feature. This is a perfect spot to throw your wallet, keys, or some other valuables because it would take a lot of effort for a thief to get in there, as opposed to an external pocket. Or you could put some Pop-Tarts in here, which also need to be kept safe from those pesky Pop-Tart thieves. As far as organization goes, we’ve been using some Eagle Creek packing cubes but we do think there is just enough internal organization here to get by without them. Between the mesh side pockets and that elastic pocket on the bottom, you can definitely keep things organized and in place in this main compartment. Overall, the internal components on this bag really wowed us. Those gusseted side pockets, the two-way access on the quick-grab pocket, and the unique main compartment really show a lot of potential for this bag. And again, the fact that DSPTCH has been able to pack all this functionality into a bag that still looks super minimalistic is impressive. We’ve been testing the DSPTCH Travel Pack for about 2 months now. It’s been on a few trips and we really have no complaints as of yet. 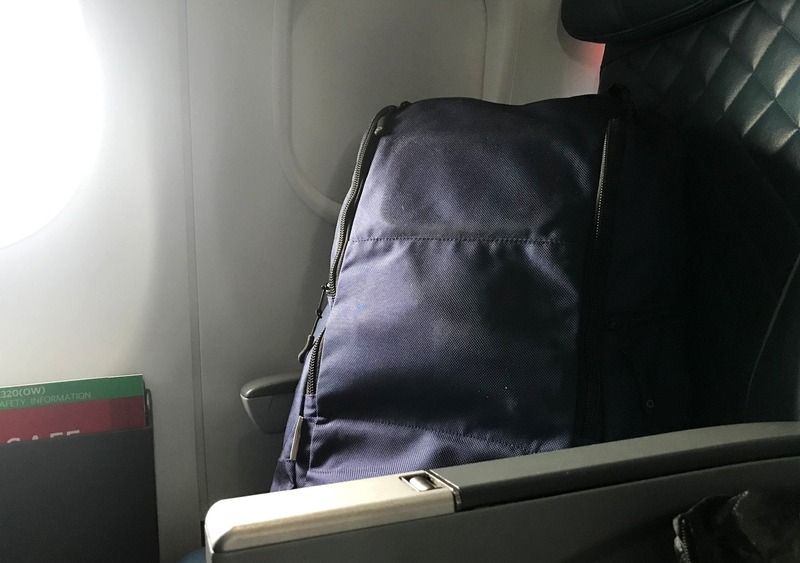 It fits well under the seat of an airplane, which is awesome, and that organization is really handy while traveling and moving around between hotels, Airbnb’s, etc. The durability has held up well—no surprise there, it’s only been 2 months—and we’re confident this bag will last a while. Between the 1680D ballistic nylon, YKK zippers and Duraflex buckles there really aren’t many weak points on this bag when it comes to durability. If you do feel like something on your bag qualifies for this warranty, you can send some pictures in to them at info@dsptch.com, and they’ll let you know if it’s covered or not. We’re pretty confident we won’t be needing to use this anytime soon, though. This pack is built in the USA—in San Francisco—which is pretty cool. DSPTCH is still a relatively small company so it’s nice to see that they’ve kept the manufacturing in the U.S. and are standing by their products. Overall, we think that DSPTCH has really knocked it out of the park with this pack. 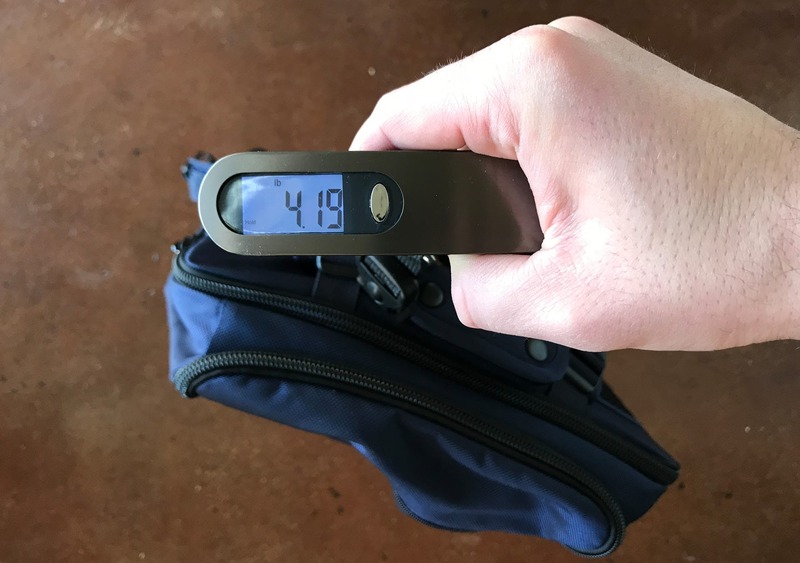 As we’ve said many times throughout this review, the amount of functionality they’ve packed into this bag while keeping that minimalistic look is pretty awesome. We did have a few gripes with the laptop compartment and the luggage roller system, but the pros seem to outweigh the cons here. If you’re looking for a one bag travel pack, the DSPTCH Travel Pack should definitely be on your list. Especially if you want something that’s not black or gray. Great! having a bit of trouble with the laptop compartment but otherwise this pack is a breeze to use and feels sturdy and durable. No complaints, brought this on a trip to NYC and it held up well. Fits under an airplane seat perfectly! No major complaints, although we are starting to see a slight discoloration on the exterior ballistic nylon in a couple places. Very minor. The Travel Pack from DSPTCH is a great option for any long term or one bag traveler. We think that there are a lot of really cool and unique design elements on this bag that set it apart from other, similar bags. It’s got a ton of functionality and organization, a great minimalistic look, and comes in a bunch of different colors. The low points on this bag were the laptop compartment, weird roller luggage system, and the overall weight. We think that the pros largely outweigh the cons on this pack though, and this holds its own with some of the best one bag travel packs out there.